April 2018update: Sorry we are out of show heifer prospects. Good news -- springs and early summer calves will being born soon. If you are looking for a Show Heifer Prospect.... Give us a call. 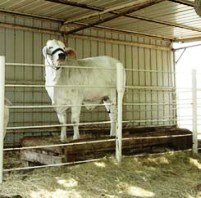 Lindley Brahmans is proud of the bulls they use in their Artificial Insemination program. 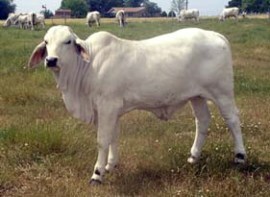 In addition to their bulls at the ranch, they also use the best bulls available to add to their outstanding calf crop. 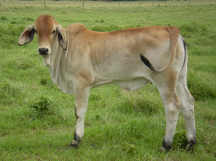 An example of the Show Heifer Prospects from Lindley Brahmans. Our Mama's raise the best little ladies. Call for availability and / or to schedule your visit. The good ones don't last long. Hope to see you soon. We welcome your visit. 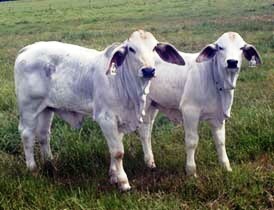 Lindley Brahman Mama's with their babies. Make your plans to visit Lindley Brahmans. 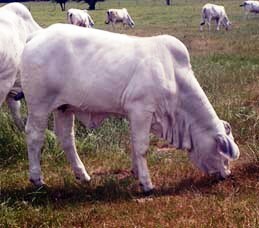 These calves are examples of Lindley Brahman show heifer prospects. This will be a dark pigmented heifer. sired by Martin, Danbury, and BL 476. Come early and select yours. Please browse this page so you will see what kind of Show Heifers prospects we like to raise. FFA and 4-H members can find quality heifers at LINDLEY BRAHMANS. These heifers are the complete package. from which you have to selection. you will see during your visit. Examples of Show Heifer prospects. We enjoy Juniors visiting and getting up close and personal with the calves. We don't have time to give them the attention they crave. LINDLEY BRAHMAN heifer calves are good. Plus they seem to love to pose for pictures. The little reddish calf will be one of the "good dark pigmented heifers" we like. 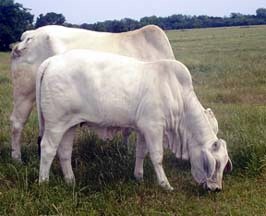 with our JT White X US Sugarland X JDH cows to obtain the growth, muscle and style that is popular today. baby, only a couple of days old. 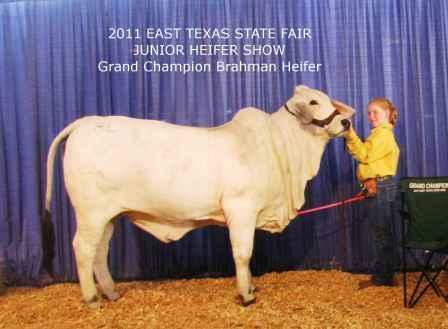 show heifer "in her day". Look at her great udder. how to make the pose. Another prospect who is showing her "good side". the hump, muscled and very femine. 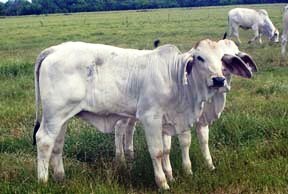 LINDLEY BRAHMANS is able to offer a few outstanding heifers each year. Plan to make your visit early to make your selections. I thought I would put in this picture for fun. Heifer standing in feed trough. not to stand on the table. We will be looking forward to your visit. Scramble winners--we gladly accept your certificate and congratulations. Savannah Allen, in the Open Show. 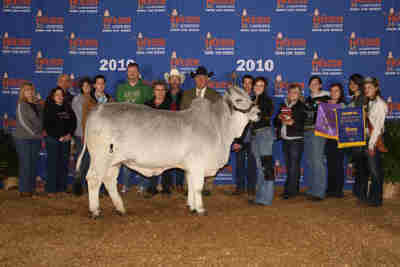 HLS&R Open Brahman Show -- Savannah's first Houston Show! She selected her scramble heifer after winning her scramble certificate. 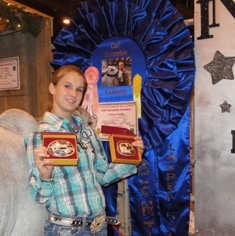 plus an extra $200 for clean and decorated stall..
Great Job Lauren and Bentley ! A Special Thank you to her scramble sponsor -- The Cowboy Lodge. 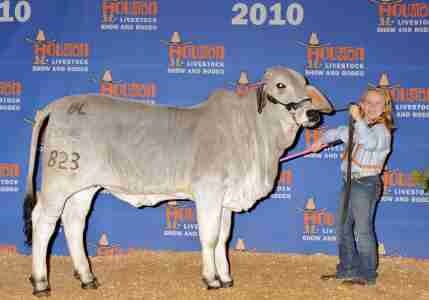 2010 Grand Champion of the Houston Junior Brahman Show. a female bred and owned by AJBA Director and TJBA President Allyson Parks. Bella is a JDH Martin Manso 849/3 daughter.